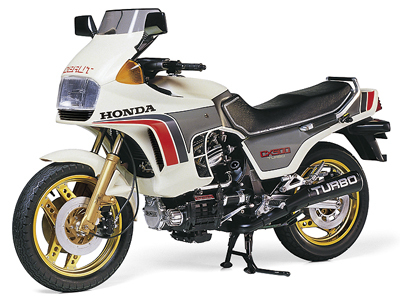 TAMIYA 16035 HONDA CX500 TURBO 1/6 scale model kit! Tamiya’s big Honda CX500 is back! This was the world’s first production motorcycle fitted with a turbo-charged engine, and Tamiya has recreated it perfectly. Kit includes metal parts to enable working parts to move, plus high-quality Cartograf decals for the markings.